A traceroute is a function which traces the path from one network to another. It allows us to diagnose the source of many problems. A traceroute will tell you how many routers your packets travel through, and how long it takes for them to travel between routers. If the routers have DNS entries, traceroute will list the names of the routers. To be effective, the traceroute should be run during a time when you are experiencing a problem. Note: The Terminal is a program included with all versions of Mac OSX When launched, it provides a command line to control of the UNIX based operating system. 4. Type traceroute followed by the domain name (yoursite.com). Note: The ms stands for miliseconds, over 200 ms can be a sign of latency. Note: Although you may see hops over 200 ms, there may be no problem at all. It is important that you send us the traceroute results so we can analyze it. 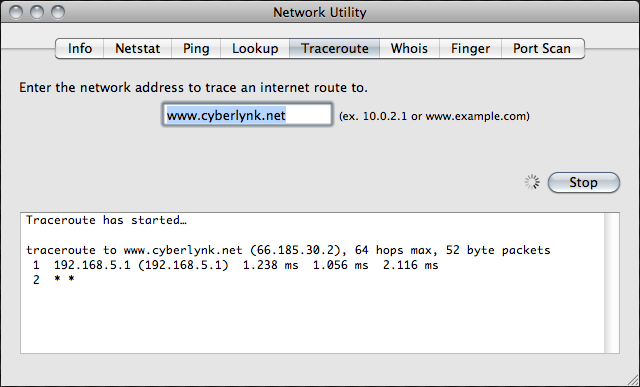 Another way to do a traceroute is through the network utility. 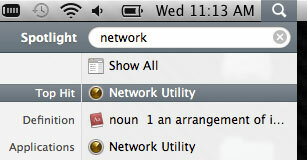 Network Utility provides a wide range of information about your network and offers tools to help you troubleshoot it. The utility includes an interface for common functions used at the command line. Such as ping, netstat, and traceroute, the information is written out to a text field, making it easy to copy into email, bug reports, or other analysis tools. 4. Select the Traceroute tab. 5. Enter the domain name or IP address of your website and click Trace.